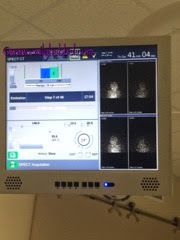 Once again scans are stable! Two of Emily's spots have an increase of uptake and one of the spots is gone. 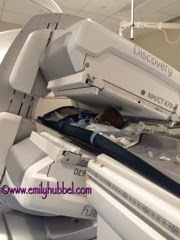 Dr Sholler again offered if we wanted to do the other DFMO trial with chemo we could, however we decided to keep Emily on the Conpassionate Use of DFMO trial she is currently on. There are no new spots and none of her spots are bigger, so we will take stable! While we continue to long for NED and to hear those three words No Evidence of Disease that so many other families hear , we are happy that Emily continues to thrive! She has been complaining of back pain when she bends over, but we are not seeing anything to accompany that pain. Emily can go to school and have friends and enjoy things, so we are happy with that. She wants to be done with treatment and we too long for her to be done with treatment! 12/23 marks 4 continuous years of treatment with no stops and she deserves to have this one day! We had hoped we were going to hear those three words though because we wanted to have a huge party to celebrate all that she has been through!! One day we will hear those words, but for now we will continue to hold her hand and fight with her! it. 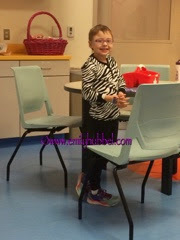 Emily always amazes us with how strong she is and how she is happy for her other friends! So for now Emily will continue on the DFMO trial and we will come back to Michigan for scans in late February or early March! Dr Sholler is happy with how she is doing so we wll continue on. Please continue to keep Emily in your thoughts. Also remember that we are still collecting bandaids until December 15th, so send them on!! I don't think we are going to make the 5000 boxes this year but we are happy with how many people have helped and continue to do so! Remember to hug and kiss your kids and tell them how much you love them! !